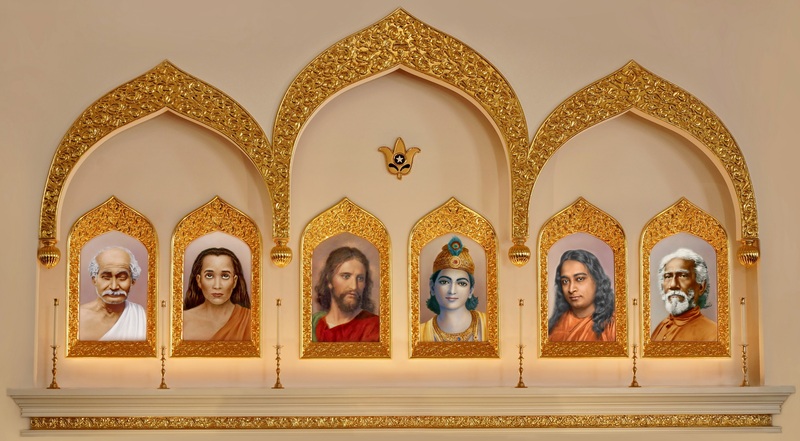 The teachings of Self-Realization Fellowship/Yogoda Satsanga Society of India are founded upon the original Christianity of Jesus Christ and the original Yoga of Bhagavan Krishna. The spiritual lineage of SRF/YSS consists of these two great avatars and a line of exalted masters of contemporary times: Mahavatar Babaji, Lahiri Mahasaya, Swami Sri Yukteswar, and Paramahansa Yogananda (last in the line of SRF/YSS Gurus). Each of these Great Ones played a role in Self-Realization Fellow­ship's mission of bringing to the modern world the spiritual science of Kriya Yoga. The passing of a guru's spiritual mantle to a disciple designated to carry on the lineage to which that guru belongs is termed guru-parampara. Thus, Paramahansa Yogananda's direct lineage of gurus is Mahavatar Babaji, Lahiri Mahasaya, and Swami Sri Yukteswar. All members of Self-Realization Fellowship (monastics as well as lay members) who have taken the sacred initiation in Kriya Yoga are disciples of Paramahansa Yogananda. He is given respect and devotion as their personal guru, and his lineage of Gurus is likewise venerated by SRF disciples. To the public at large, Jesus propounded a simple philosophy of faith, love, and forgiveness. He spoke often in parables, pregnant with timeless morals. But to his close disciples he taught deeper truths, truths that have their correspondence in the deepest metaphysical concepts of the more ancient yoga philosophy. When his disciples questioned Jesus, “Why speakest thou unto them in parables?” he answered, “Because it is given unto you to know the mysteries of the kingdom of heaven, but them it is not given....Therefore speak I to them in parables: because they seeing see not; and hearing they hear not, neither do they understand” (Matthew 13:10, 11, 13). “Jesus Christ is very much alive and active today. In Spirit and oc­casionally taking on a flesh-and-blood form, he is working unseen by the masses for the regeneration of the world. With his all-embracing love, Jesus is not content merely to enjoy his blissful consciousness in Heav­en. He is deeply concerned for mankind and wishes to give his fol­lowers the means to attain the divine freedom of entry into God’s Infinite King­dom. He is disappointed because many are the churches and temples founded in his name, often prosperous and powerful, but where is the com­munion that he stressed — actual contact with God? Jesus wants temples to be es­tablished in human souls, first and foremost; then established outward­ly in physical places of worship. Instead, there are countless huge edifices with vast congregations being indoctrinated in church­ianity, but few souls who are really in touch with Christ through deep prayer and meditation. Bhagavan Krishna lived many centuries before Christ. Revered throughout India as an avatar (incarnation of God), the historical facts of Krishna’s life are interwoven with a maze of legend and mythology. There are no historical records relating to the birth and life of Mahavatar Babaji. Paramahansa Yogananda has written in Autobiography of a Yogi that the deathless avatar has resided for untold years in the remote Himalayan regions of India, revealing himself only rarely to a blessed few. Lahiri Mahasaya was born on September 30, 1828, in the village of Ghurni in Bengal, India. At the age of thirty-three, while walking one day in the Himalayan foothills near Ranikhet, he met his guru, Mahavatar Babaji. It was a divine reunion of two who had been together in many lives past; at an awakening touch of blessing, Lahiri Mahasaya became engulfed in a spiritual aura of divine realization that was never to leave him. Mahavatar Babaji initiated him in the science of Kriya Yoga and instructed him to bestow the sacred technique on all sincere seekers. Lahiri Mahasaya returned to his home in Banaras to fulfill this mission. As the first to teach the lost ancient Kriya science in contemporary times, he is renowned as a seminal figure in the renaissance of yoga that began in modern India in the latter part of the nineteenth century and continues to this day. As Lahiri Mahasaya exemplified the highest ideals of Yoga, union of the little self with God, he is reverenced as a Yogavatar, or incarnation of Yoga. Lahiri Mahasaya entered mahasamadhi in Banaras, September 26, 1895. Fifty years later, in America, his prediction was fulfilled when an increasing interest in yoga in the West inspired Paramahansa Yogananda to write Autobiography of a Yogi, which contains a beautiful account of Lahiri Mahasaya’s life. Swami Sri Yukteswar was born on May 10, 1855, at Serampore in Bengal, India. Sri Yukteswar was a disciple of Lahiri Mahasaya and attained the spiritual stature of a Jnanavatar, or incarnation of wisdom. Sri Yukteswar recognized that a synthesis of the spiritual heritage of the East with the science and technology of the West would do much to alleviate the material, psychological, and spiritual suffering of the modern world. These ideas were crystallized by his remarkable encounter with Mahavatar Babaji, the guru of Lahiri Mahasaya, in 1894. Under Sri Yukteswar’s spiritual training and discipline, Sri Yogananda was prepared to begin his worldwide mission in the West. Sri Yukteswar named Paramahansa Yogananda sole heir to his spiritual mantle and ashram properties. Swami Sri Yukteswar entered mahasamadhi on March 9, 1936, during Paramahansaji’s visit to India after fifteen years in America. 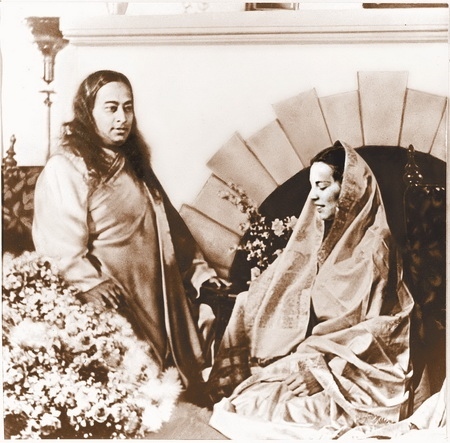 As described above, Paramahansa Yogananda was personally blessed by Mahavatar Babaji, Lahiri Mahasaya, and Swami Sri Yukteswar — all three of the paramgurus in his spiritual lineage — to carry out the mission of disseminating Kriya Yoga worldwide. From its founding in 1920 until shortly before Paramahansa Yogananda’s mahasamadhi in 1952, all of Self-Realization Fellowship’s activities and organizational matters were personally directed by Yogananda himself. Thereafter, the leadership of his work passed to Rajarsi Janakananda, a close disciple of Paramahansaji’s chosen by him to serve as president of SRF and who succeeded him upon his passing in March 1952. Born James J. Lynn on May 5, 1892, in Archibald, Louisiana, Rajarsi Janakananda met Paramahansa Yogananda during the guru's lecture series in Kansas City in 1932. 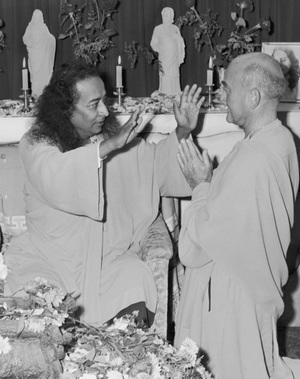 Because of his rapid advancement in Kriya Yoga, Paramahansaji lovingly referred to him as “Saint Lynn.” In 1951 Yogananda bestowed on him the monastic title of Rajarsi Janakananda (after the spiritually illustrious King Janaka of ancient India) and turned over to him the responsibility of guiding the SRF/YSS work. The exemplary life of Rajarsi Janakananda, a great Western yogi, came to an end on February 20, 1955. Sri Daya Mata succeeded Rajarsi Janakananda as the third president and spiritual head of Self-Realization Fellowship/Yogoda Satsanga Society of India in 1955. Born in Salt Lake City on January 31, 1914 as Faye Wright, she met Paramahansa Yogananda when he came to give lectures and classes there in 1931. Shortly thereafter, she entered his ashram as a nun. Paramahansaji's choice of Sri Daya Mata as the future leader of his worldwide society was confirmed by Mahavatar Babaji in an encounter Daya Mata had with the Mahavatar during a pilgrimage in India in 1962. Sri Daya Mata passed away on November 30, 2010, after more than 55 years as SRF/YSS president. Sri Mrinalini Mata succeeded Sri Daya Mata as president and spiritual head of Self-Realization Fellowship/Yogoda Satsanga Society of India on January 7, 2011, and served in these roles until her passing on August 3, 2017. She too had been personally chosen and trained by Yogananda to help guide the work after his passing, and played many important leadership roles during her seven decades as an SRF monastic disciple. 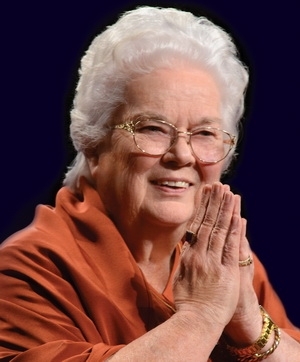 Born in 1931 in Wichita, Kansas, Mrinalini Mata met Paramahansa Yogananda in December 1945 at the age of fourteen and shortly afterwards entered the Guru’s ashram in Encinitas, California, to dedicate herself to a life of service as a nun. In addition to serving for decades as editor-in-chief of SRF/YSS publications, Sri Mrinalini Mata also served as SRF vice president for forty-five years, closely assisting Sri Daya Mata in the overall guidance of the SRF/YSS monastic order and overseeing the numerous activities and services of the society worldwide. On August 30, 2017, Brother Chidananda succeeded Sri Mrinalini Mata as the fifth president and spiritual head of SRF/YSS. 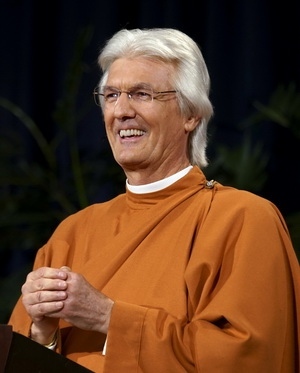 He has been a monk of Self-Realization Fellowship for more than forty years. Almost from the start of his monastic life, Brother Chidananda worked closely with Sri Mrinalini Mata assisting her in the editing and publishing of the works of Paramahansa Yogananda and other SRF publications. He was appointed a member of the SRF and YSS Boards of Directors by Sri Daya Mata in 2009, and has also served for many years as a member of the management committee that oversees SRF’s myriad activities and operations under the guidance of the president. As president, Brother Chidananda is assisted by a Board of Directors, which includes other monastics who have been trained by direct disciples of Paramahansaji. Dozens of direct disciples who had benefited from personal association with Yogananda lived out their lives in SRF ashrams in the decades following his passing, loyally serving his organization and supporting the leadership he had appointed. All of the members of the Board of Directors are members of our monastic order who have taken final, lifelong vows of renunciation. Serving without salary, they and the other monks and nuns in SRF ashrams have devoted their lives fully to the mission begun by Paramahansa Yogananda. Under the direction of the president and Board of Directors, monks and nuns of the SRF Order serve in many capacities in the society’s ashram centers; travel to cities around the world to conduct lectures and classes and to lead retreats; and provide spiritual counsel and guidance—by phone, letter, and in person—to students of the Self-Realization Fellowship teachings. Many dedicated SRF lay members also serve Paramahansa Yogananda’s worldwide work in indispensable ways—working with the monastics at the International Headquarters and other SRF ashram centers, and carrying many responsibilities in the temples and meditation centers around the world.